It’s been five years since Dr. Khushi Dhaliwal opened Tampa Bay Family Physicians in Sun City Center. As its sole practitioner for the first four years, she offered area residents quality preventative care, treatment for acute and chronic conditions and a variety of in-office procedures. 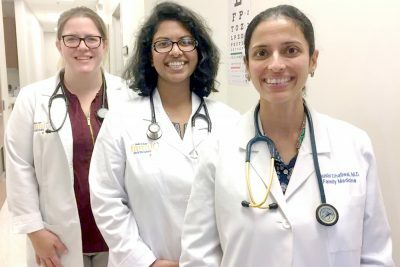 The medical staff at Tampa Bay Family Physicians includes from left: Jami Martinez, ARNP, Dr. Shemushi Nasreen and Dr. Kushi Dhaliwal. Both doctors are board certified in family medicine. As more and more people became patients, Dhaliwal saw the need to hire some help to maintain her high standards of care. So after flying solo until last year, she hired Jami Martinez, an advanced registered nurse practitioner certified in family medicine. Martinez, 36, said she always wanted to be a nurse. Now that her dream has been realized, Martinez works hand in hand with Dhaliwal. Martinez earned her bachelor’s and master’s degrees in nursing from the Chamberlain School of Nursing. Her work history includes more than nine years at Palm Gardens in Sun City Center, where she was first a wound-care nurse, and then a nurse assessment coordinator manager. From 2013 until she accepted the job at Tampa Bay Physicians, Martinez was employed as a telemetry nurse in South Bay Hospital’s progressive care unit and as a relief charge nurse. She and her husband Carlos, who owns a company that installs wood flooring, live In Riverview with their two daughters, ages 2 and 9. She enjoys soccer, boating, going to the beach and doing things with her children. In September, Dr. Shemushi Nasreen, 33, joined the growing practice. Board certified in family medicine, she also fulfilled a lifelong dream when she became a physician. “As far back as I can remember, I wanted to be a doctor,” she said. “I grew up in Bangladesh, where the healthcare system is very poor, with only very basic care and no preventative medicine. 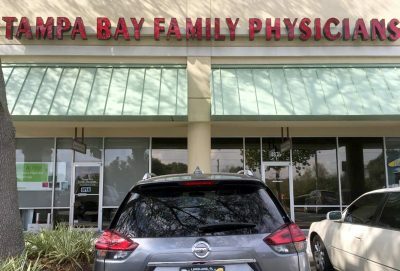 Tampa Bay Family Physicians is located in the Kings Crossing Shopping Center at 4874 Sun City Center Blvd., Sun City Center. Like Martinez, Nasreen finds much satisfaction in her work. Nasreen earned a bachelor’s degree in neuroscience from the University of Pittsburgh in 2008 before studying medicine from 2009 to 2013 at the American University of the Caribbean School of Medicine on the island of St. Maarten. She completed her residency at St. Mary Mercy Hospital in Livonia, Mich. in 2017. The doctor is fluent in Bengali and English and knows a bit of Spanish. She and her husband, Eric, an emergency medical physician at Brandon Regional Hospital, live in Lithia with their 2- and 4-year-old daughters and 6-month-old son. Her interests outside of medicine include traveling, global literature and learning languages. Dhaliwal, 39, is delighted with both of her colleagues. “They’ve definitely opened up the schedule for both new and sick patients, so we’re able to offer same-day appointments in most cases,” she said. “They’re very professional, very dedicated and are excellent additions to the practice. Patients love them. Dhaliwal is a board-certified doctor of family medicine who has practiced for the past 15 years. A native of India, she earned her medical degree from MGR Medical University and completed her internship in 2002. She worked at several medical facilities in India before coming to the United States to marry in 2007, and then completed an observership at Tampa General Hospital and the H. Lee Moffitt Cancer Center, where she shadowed a physician for 20 months to learn the U.S. health system. The doctor completed her residency in family medicine at the West Virginia University Ruby Memorial Hospital in Morgantown in 2012. She has privileges at South Bay Hospital in Sun City Center and St. Joseph Hospital South in Riverview, where she sees patients while they’re hospitalized. Dhaliwal and her husband, Paul, the practice administrator, have three daughters, ages 4, 7 and 10. The family resides in Tampa. 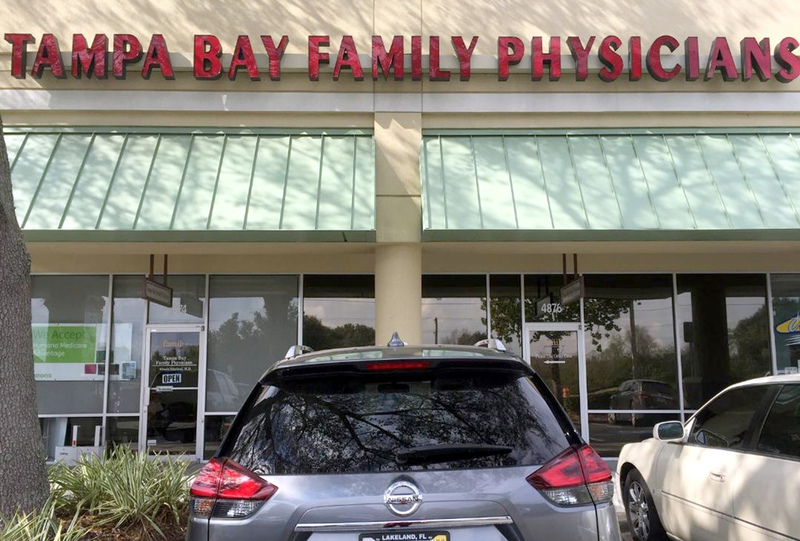 Tampa Bay Family Physicians is located in the Kings Crossing Shopping Center at 4874 Sun City Center Blvd., Sun City Center. It serves residents of Sun City Center, Wimauma, Ruskin, Riverview and Apollo Beach and provides high-quality healthcare for men, women and children ages age 5 and older. Medicare and the following insurance plans are accepted: Aetna, AvMed, Blue Cross Blue Shield, CarePlus, Coventry, Freedom Health, Humana, MultiPlan Network, Optimum HealthCare, PHCS Network, Simply Healthcare, Tricare and United Healthcare. Quest and LabCorp tests are performed in-house, as well as EKGs, cryotherapy, injections, sutures and other minor procedures. For an appointment or more information, call 813-633-2000.